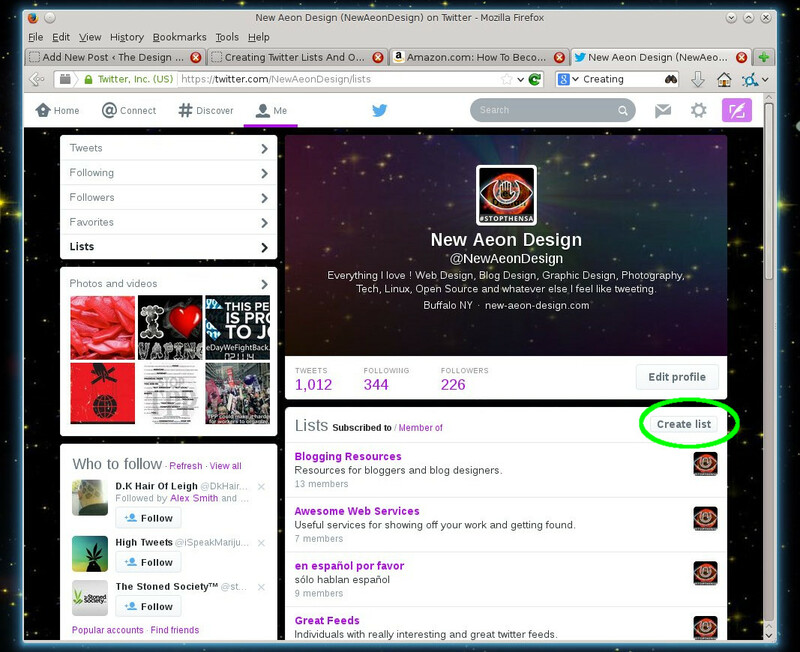 Twitter now gives you a 1500 x 500 px header image for your profile page. The new look of twitter is great and that’s a lot of real estate to fill. I decided to play around with it a bit and here’s what I discovered. Going to the twitter help page https://support.twitter.com/articles/127871-customizing-your-profile# They give you the suggested dimensions for the new header of 1500 x 500 px. I used Gimp 2.8 and opened up a new image, 1500 width by 500 height. I added my spacey background, and then opened up some of my old header xcf files from Facebook and G+ and copied and pasted together a quick header image. 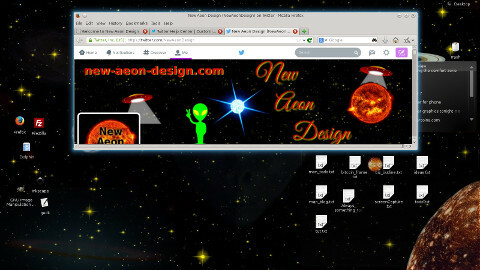 I added the alien from some clipart, and copied and pasted the rest of the design from some other headers I created for the New Aeon Design. The whole project took about a half an hour. The new header 1500 X 500 px shown in open browser. This was just a quick experiment. I would suggest adding some business keywords, url, and company logo. Keep it simple. Once the file was completed I saved it as a png file and uploaded it to twitter. The first thing I discovered about the suggested 1500 x 500 px is that there is about a 50 px border from the top edge and along the bottom edge that will cut out on you. So I had to move the url found on the upper left hand corner of the image down about 50 px. I also moved all the images and graphics along the bottom edge up 50 px. This took care of the problem and when the browser window is resized it still shows all the graphics. However, when I redo this I will probably add another 10 px border for browser resizing. When the browser is resized I noticed that a very tiny amount of the lettering got cut off. Nothing major, and everything was still readable. Now I tried to get creative and put a little u.f.o. with a light shining over my twitter avatar. I really liked the way this looked when the browser is set to full screen, however when the browser is resized the avatar doesn’t scale with the header image and off sets the u.f.o. I’m leaving it for now, but this has to be changed down the road. 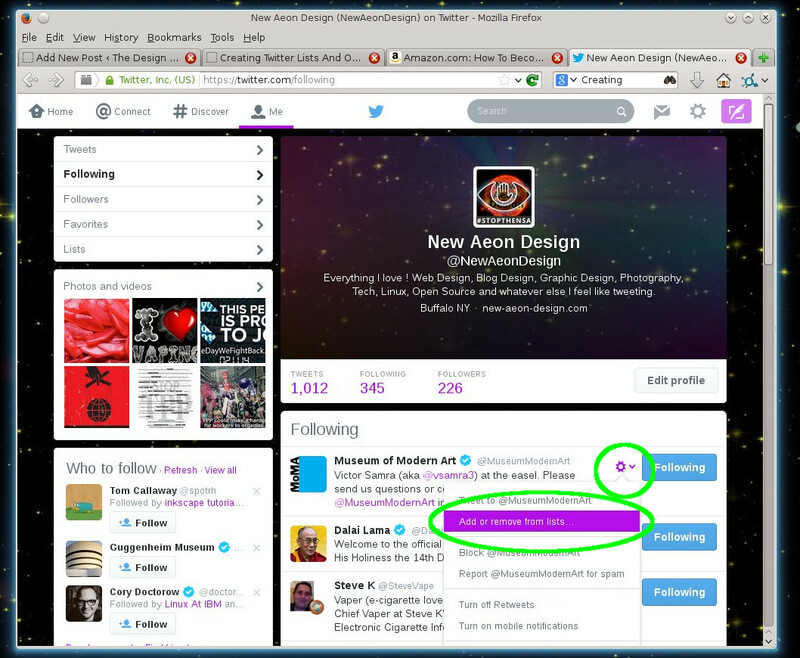 Notice that when the browser window is resized the twitter avatar doesn’t scale with header image. This offset the U.F.O just enough to be annoying and unprofessional. When I update this header, that will have to be changed. Outside of the avatar issue, the new header dimensions are great. That’s a lot of real estate to fill with information about your company, brand, or product. When creating your header I would suggest adding your url to the design, a couple keywords about what your company does, like “Web Design”, or “Wholesaler of World Class Widgets”, your logo and business name. Keep it clean and simple. In the world of headers less is sometimes more ! If anyone wants a header designed for their business message me on twitter with what you want, and I’ll shoot you a quick price. Most designs start around $40.00 bucks. The header as it was designed. Notice the 50 px border along the sides. If you don’t move everything in about 50px you will have parts of the image cut out when you upload the final product. Hope these tips help, and happy tweeting everyone ! If you have any further suggestions please comment, and if you’re on twitter folllow me and I’ll probably follow back . This entry was posted in graphics, Social Networking, twitter and tagged graphic design, header, tips, twitter on April 22, 2014 by NewAeon. O.K. I think this is going to be the last post on Twitter for a little while. However, I think a few words are in order about creating Public vs Private lists. If you want to learn more about creating lists see my last post here. So we’re creating some lists and now we have to decide are the lists going to be public or private. Here are some things to consider when making your choice. Most people appreciate being added to a public list. Great for exposure as other people can subscribe to the list. As others subscribe it’s a great way to network and make new contacts with your fellow industry peers. Good way to keep an eye on competitors and check in on them once in awhile. These are just a few things to think about when deciding whether a list should be public or private. Another consideration to private lists is maybe setting up a second account for things you may not want to share with your followers, potential sales leads, and clients. What ever you decide, I’m sure you can agree that lists are a great way to organize your content, add value to your twitter account, create additional exposure for you, and give prospects another good reason to follow you. This entry was posted in Blogging, Social Networking, twitter and tagged lists, social networking, twitter on February 17, 2014 by NewAeon. 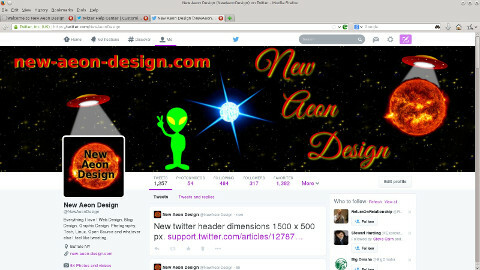 New Aeon Design is on Twitter. I have to say I was more than a bit skeptical of using Twitter, I really didn’t understand it, and couldn’t see how it could be of benefit to use it. Man was I wrong, and what a pleasant surprise. Using Twitter has proven to be an invaluable experience. I’ve met a ton of people from my industry, networked, found all kinds of cool freebies like the twitter graphic used in this post and learned that I don’t know as much as I thought I knew about this industry. I’VE LEARNED A LOT. I’m sold on twitter, and think it would be a HUGE mistake for any business especially someone in the design and internet marketing business to not use it. O.K with that said, one of the first things I experienced was information overload. I searched twitter for everyone in graphic design and webdesign and quickly had a very informative informaton stream filled with everything from design offers, graphic freebies, and all kinds of tutorials. I love learning new things and this had proven to be a very informative and effective way of finding new information in my industry. However as you post, people find you and start to follow you. Many of these people aren’t in your industry, and there submissions will range from jokes, self help , inspirationall quotes, to special offers on all kinds of different products.As people start following your feed, it’s proper twitter etiquette to follow back so your gold mine of information on your industry suddenly gets watered down with ecig adds, inspirational quotes, jokes, and just about anything else you can imagine. What do you ? Lists ! Lists are a great way to create order out of chaos ! Lets say your following 50 people in the web design field and all they post is information about web design. You have another 20 people in the graphic design field who post only graphic design related stuff. You aquired 10 followers who post jokes all day and another 15 who post inspirational quotes. Do to some research you were doing for a client you ended up following 5 guys who are in the ecig business and they post everything you ever wanted to know about ecigs and more. Your stream is now complete chaos and finding any information in the ocean of ever growing posts is becoming very difficult. Here’s what you do. Put each group in a list. Create a list called web design and add those 50 people to that list. Create a list for your graphic design folk and another list for the comedians, add yet another list for the guru’s and inspirational quotes. Basically create a category or list for every different subject your following. Twitter makes this pretty simple to do. Here’s how. First click on the Me tab, and then click on the lists link. When the list page opens, click on the create list radio button. When the list window opens name it, add a description and make it public or private. In order to not make this post any longer I’ll post more on public vs private in another post. I made mine public, you can make your own decision on this. Then click save list.Update: Click here for public vs private if you’re not sure. Now we have to add people to the list. The easiest way is to click on the following link and find all the people your following. 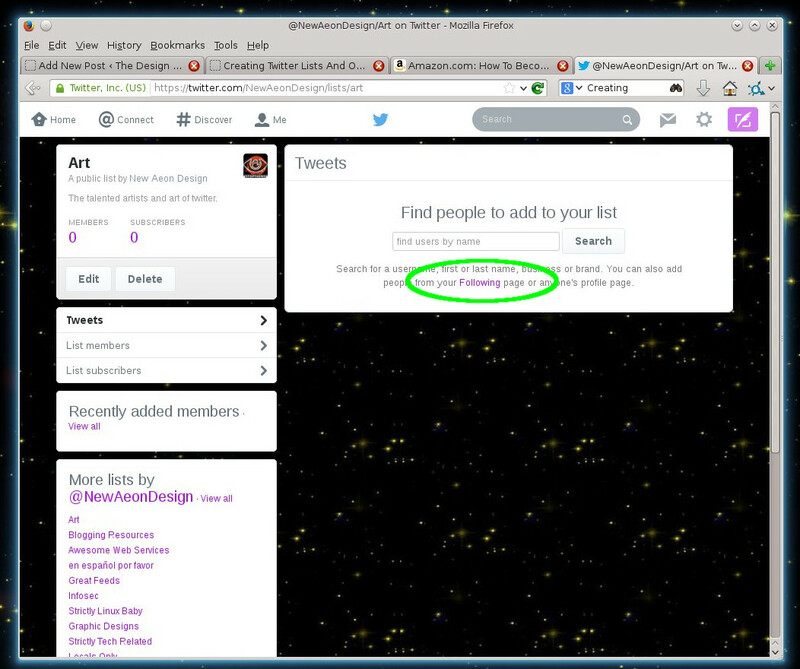 Then click on the little gear icon and select add or remove to lists. Thats it your done. Now just lather, rinse and repeat with everyone who fits into the topic of that list ! Now when you need information on web design click on the web design list and every tweet in that category will come up for you. When you need to know what’s happening in the world of ecigs click on that list, and when you want to lighten up the mood click on the list of all the funny folks. Man does it ever make life easier when your trying to sort through the information. Not to mention many twitter users like being added to specialized lists. One reason you might want to make them public. Alright that’s done ! But wait, there’s more ! One last thing. Being on twitter is all about getting found, and being seen. Many of us are trying to get our name out there and introduce people to our brand or company. For whatever reason, twitter doesn’t add us to our own lists. If anyone subscribes to your lists you may want your tweets found in there as well so here’s what we have to do. Why twitter doesn’t give you an option to do this is beyond me, but what you have to do is go to https://tweetdeck.twitter.com/ to add yourself to your own lists. The good news is you really don’t even need to sign up for another service, you just use your twitter username and password to log in. 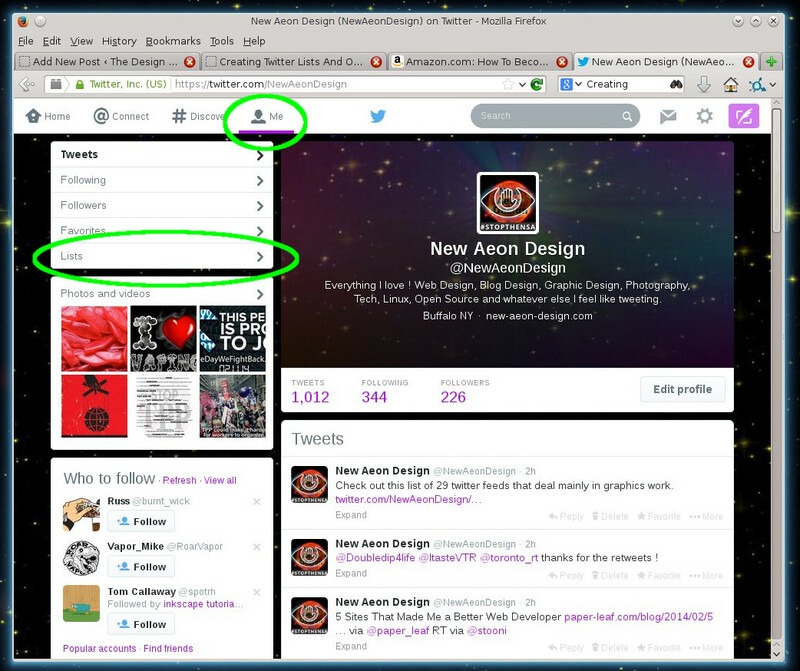 Now click on the lists button on the left hand side of the screen. Select the list you want to be added to and click edit. Enter your @twitterUserName and click done. You’ve now added yourself to your own list and we are finished. 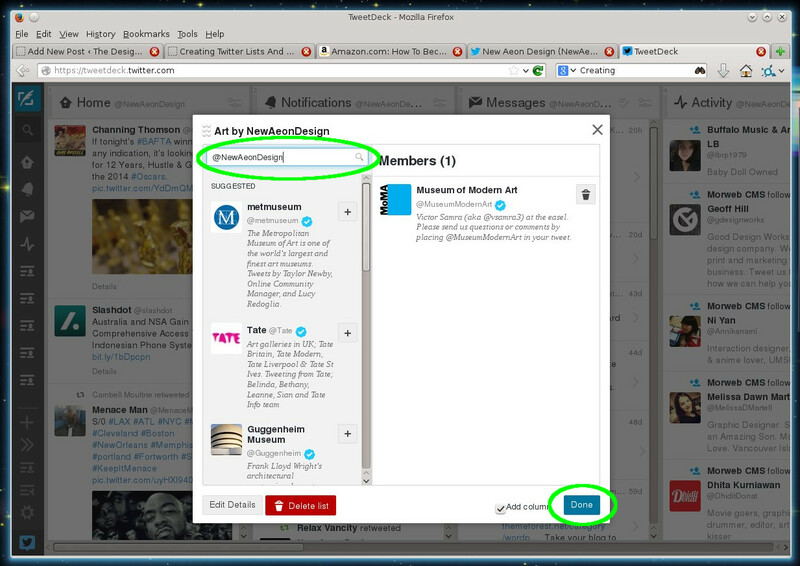 Now log out of tweetdeck and go back to your twitter lists and you should find that you have been officially added. Here’s a couple lists I created please feel free to follow. It’s a little bit of work but in the long run I really think it’s worth the effort. It makes your information so much easier to find, and its a good way to possibly attract a couple new followers. As always, thanks so much for reading The Design blog and taking an interest in New Aeon Design. Feel free to comment, or send out a shout using the twitter widget found in the side bar. Happy Tweeting everyone ! This entry was posted in Social Networking, twitter and tagged lists, organization, organizing, social networking, twitter on February 17, 2014 by NewAeon. 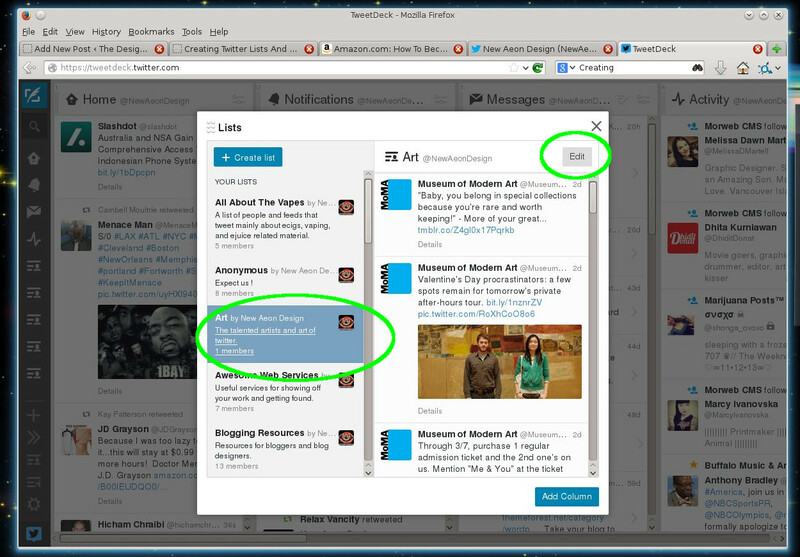 Add A Twitter Feed To Your Blog Or Website. I wanted to make my blogs, and websites a little more interactive, and also give people another way to interact with and or contact me. 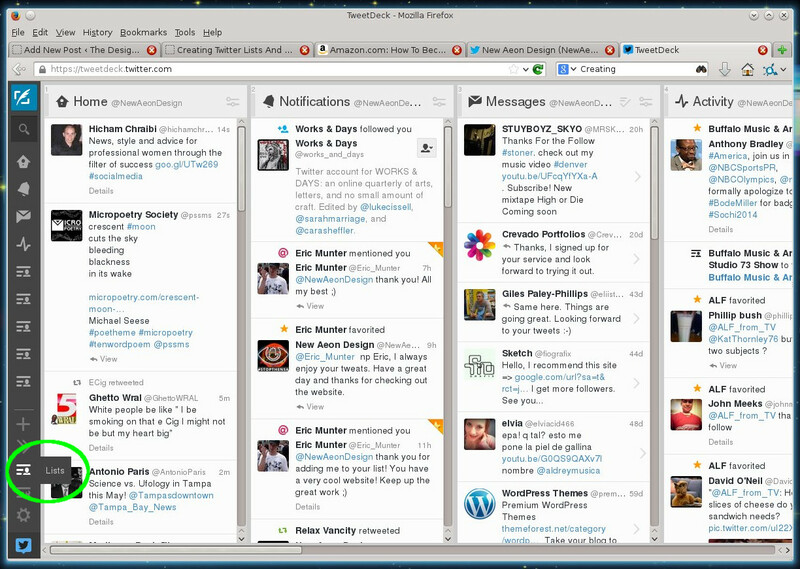 I decided on creating a twitter widget to put in the sidebars of my blogs, and also add to the front page of the website. The process was surprisingly easy. Here’s what you do. If you don’t have a twitter account you want to go to twitter.com and create an account. O.K. we’ve got our account set up, now go to https://twitter.com/settings/widgets . If you’re not logged into your account, twitter will ask for your username and password and then it should open to a page that has a box that say widgets with a radio button that says “Create New”. Click on create new, and the next page that opens will be the configuration page. 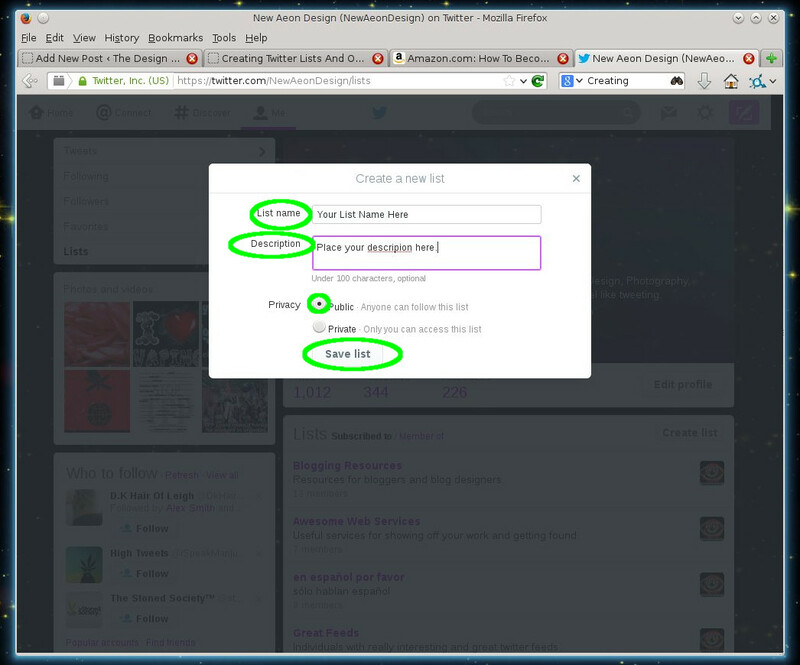 Put your @twiiterUserName where it asks for it, and then configure it. If you want replies to show up in your time line then uncheck that box, click whether you want your photo’s to auto-expand or not, adjust your height, theme color, enter your link color hex code or stick with the default, and click create widget. Thats it your done, when the next page loads, cut and paste the code into your blog or website and you’ll have a cool twitter feed, posting all of your updates in real time. 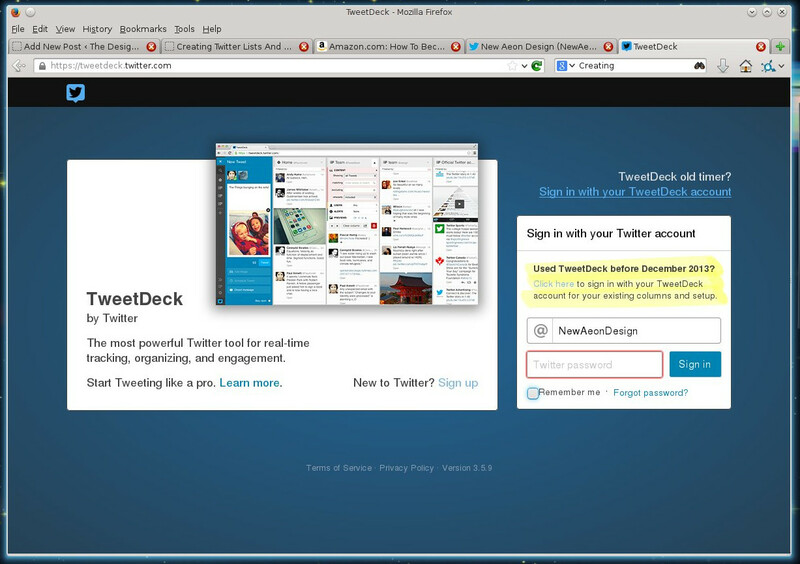 I placed the twitter feed on my Tumblr blog in the sidebar. It’s a custom theme I created so, you’ll have to read the Tumblr documentation to install it in yours. For Tumblr I basically just created another side box and pasted the code into it. On my website, I did some rewriting of my css to make it responsive to both browsers and phone screens, and using the @media code the widget will even be omitted from smaller displays so the page still displays properly in most devices. On this wordpress blog, using the 2012 theme, I just clicked on appearance, widgets, dragged a text box over to my sidebar, and pasted the code in the text box. It really couldn’t of been any simpler with wordpress and this is one of the reasons I’m really glad I decided to give WordPress a try. Between the website, Tumblr, and this WordPress blog, WordPress was hands down the easiest to install the widget in ! If you want to get a bit crazy with this project and really customize the heck out of the timeline and make it your own, you can check out the developers page here. This was a really, easy, fun project, and I think it’s a great way to add a little interactivity to your blog or website. Any questions, please feel free to comment, or tweet it from the side bar. Thanks for reading and good luck ! This entry was posted in Blogging, html css, Social Networking, tumblr, tutorials, twitter, web design, Wordpress and tagged blog, blogging, css, html, social networking, tumblr, twitter, web design, wordpress on February 12, 2014 by NewAeon.